Jason Jones has made his career out of preserving old artwork for future generations. 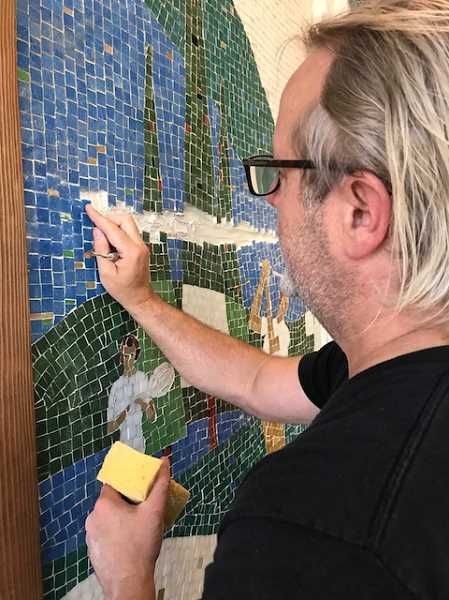 So when the Portland-based sculptor and conservationist was asked to restore two tile mosaics salvaged from a 1960s-era shopping center, he says he jumped at the chance. The result: a beloved part of the Wizer Block is now on display in the entrance to the public parking garage of The Windward, the mixed-use project that recently celebrated its grand opening in downtown Lake Oswego. It's the culmination of a promise made more than three years ago by developer Patrick Kessi, who vowed to honor the city's history even as he worked to shape its future. "PHK Development reached out to me and asked if (the mosaics) could be restored," Jones told The Review this week. "I went down, looked at it and told them, 'Absolutely.'" The artwork was in terrible shape, though. "They were on these old plywood panels and were falling off," Jones says. "The tile was just balancing on these plywood panels." 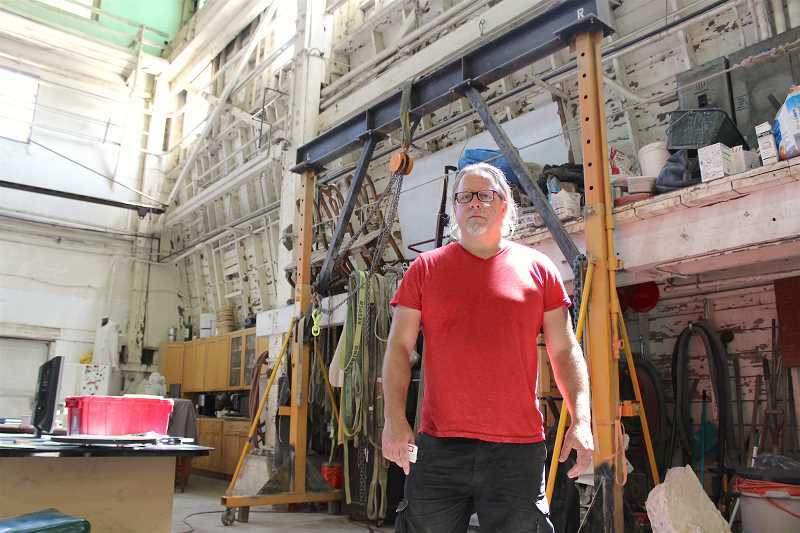 Jones took the mosaics back to his studio in Northwest Portland and used a modified gantry crane to hoist the two pieces into the center of his workshop. He worked on them there for five and a half months, using a technique developed a few decades ago for restoring and conserving paintings. Imagine you have a painting on a piece of wood, Jones explains, and the wood is rotten. Experts figured out a way to laminate the artwork so that it had a rigid support in the front, remove the damaged wood from the back and replace it with a new canvas or engineered support. Then they removed the protective overlay, leaving just the paint. "Now you have that paint, paint only, established on a new foundation," Jones says. "I thought, 'Why can't we do that with these tiles? If we just take 30,000 tiles off, there's no way we're going to put this back together the way the original artist did.'" Jones started his career remodeling historic homes and buildings, so he'd seen his fair share of tile mosaics and was confident the process would work this time. Still, he admits, "we had some failures." "I was gambling that my glue to the front would be hard enough to defeat the old glue, but there were about 1,000-2,000 tiles that it didn't do that on," he says. "So we had to pull those and individually replace them with the old tile onsite in Lake Oswego." There were also about 600 missing tiles. "We had to fill those with modern pieces, but they don't really show," Jones says. "I'm super happy with how it turned out." One of the things Jones kept in mind when restoring the Wizer mosaics was reversibility — a practice in art conservation that he tries to follow religiously. Instead of just conceptualizing how he was going to get the mosaics onto the wall at The Windward, he also thought about how someone might take them down and move them in the future. That meant making sure the restoration process and materials he was using were conducive to the longevity of the mosaics as much as they were to them being mounted to stay put. "What I had to do was more of a deep-aortic bypass surgery so that the next time (the mosaics need to be moved), it's going to be like putting ointment on a sore elbow," he says. The restoration project cost about $20,000, according to Kessi, who also used reclaimed wood from the Wizer Block for beams and benches and saved the historic lampposts that once ringed the shopping center's parking lot. "We really wanted all of that to become part of the future of Lake Oswego," he told The Review this week. 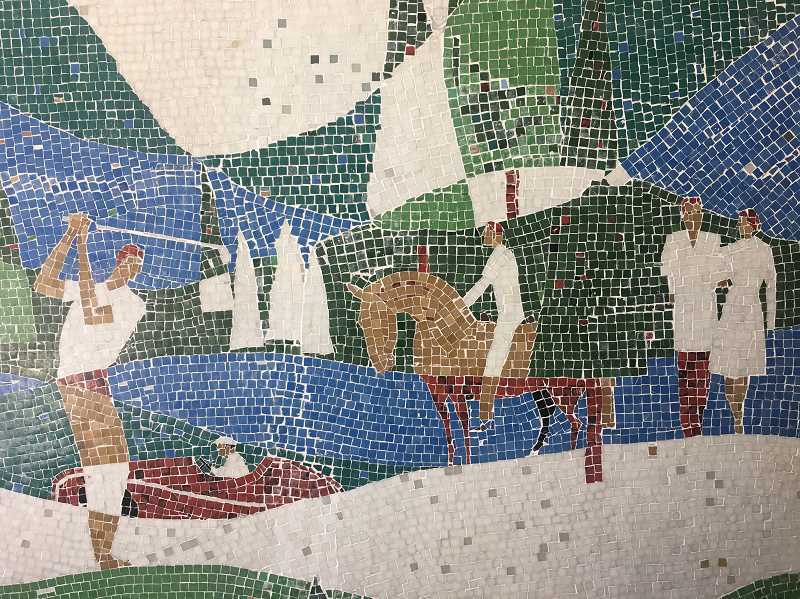 Jones says he's especially excited for longtime Lake Oswegans who remember the mosaics from their days hanging in the Wizer building to see them restored and placed inside The Windward as an homage to the past. "This is what my whole career is about," he says. "I like to preserve the past and hold onto these types of artifacts. We're talking about artists of the late 1950s and early 1960s here. It's interesting our society cares enough to have their work reconstructed and put back on a wall."